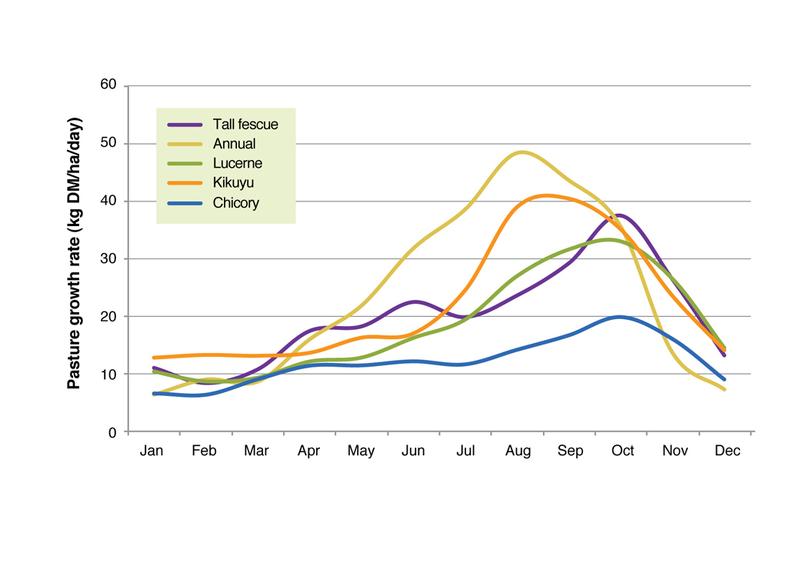 Deep-rooted summer active perennials; kikuyu, lucerne and chicory, extend the growing season and reduce the need for supplementary feed in summer and autumn compared to annual based pasture systems in south-coast Western Australia. Kikuyu recorded the highest dry matter production at the EverGraze Proof Site in Wellstead during summer. Perennials extended the growing season, producing over 10kg DM/ha/day in November and December. Lucerne and chicory provided quality out of season feed with summer/autumn dry matter digestibility of around 70% for lucerne and 80% for chicory. Perennial swards at Wellstead had lower winter production but similar overall annual production compared to annuals at around 6 tonnes of dry matter per hectare. Kikuyu plays an important role in maintaining ground cover and providing out-of-season feed for maintenance of ewes. Traditionally livestock systems on the south coast of WA have been based on grazing annual pasture species like ryegrass and sub clover. In order to maintain livestock through summer and autumn, producers rely on dry pasture residue and supplementary feeding of grain or conserved pasture. The downside to this feedbase is the decline in the quality of dry pasture residue, the cost of conserving pasture and reliance on supplementary feed with associated costs. For example modelling for the Albany Proof Site suggests the optimum traditional system costs $253/ha in supplement to produce prime lamb. EverGraze set out to demonstrate the possible benefits of including summer active perennials kikuyu, lucerne and chicory into existing grazing systems with the potential to extend the growing season and provide green feed in summer. Examples of benefits include reduced supplementary feed, increased weaner survival and improved ewe condition pre joining. The 60 ha EverGraze Proof Site (Figure 1) was planted to summer-active perennials to assess the economic and natural resource benefits of these pasture types. Species sown in the spring of 2005 included lucerne, kikuyu, tall fescue, chicory, panic and setaria. In the autumn of 2007, as a consequence of the drought and the loss of tall fescue, a number of plots were sown with annual ryegrass and subterranean clover and the remainder re-sown to tall fescue. At the same time one chicory stand was over sown with subterranean clover to increase annual legume content. In 2008, a lucerne stand and two chicory stands were over sown with subterranean clover and serradella respectively. Merino ewes mated to Poll Dorset sires ran on the site from 2006 to 2008 achieving an average 120% weaning. 2007 – In autumn plots 1 to 7 and 10 and 19 received 60 kg/ha agras, in winter all plots received 200 kg/ha of super:potash 2:1 and plot 10 received 100 kg/ha urea. Livestock were rotationally grazed according to available feed on offer (FOO) which was measured when sheep entered and exited each paddock. Typically sheep were moved once pastures reached a FOO of around 800 kgDM/ha. Measurements taken included pasture yield, FOO, ground cover and species composition. Livestock condition was managed according to Lifetimewool principles and as such ewes were weighed and condition scored monthly. 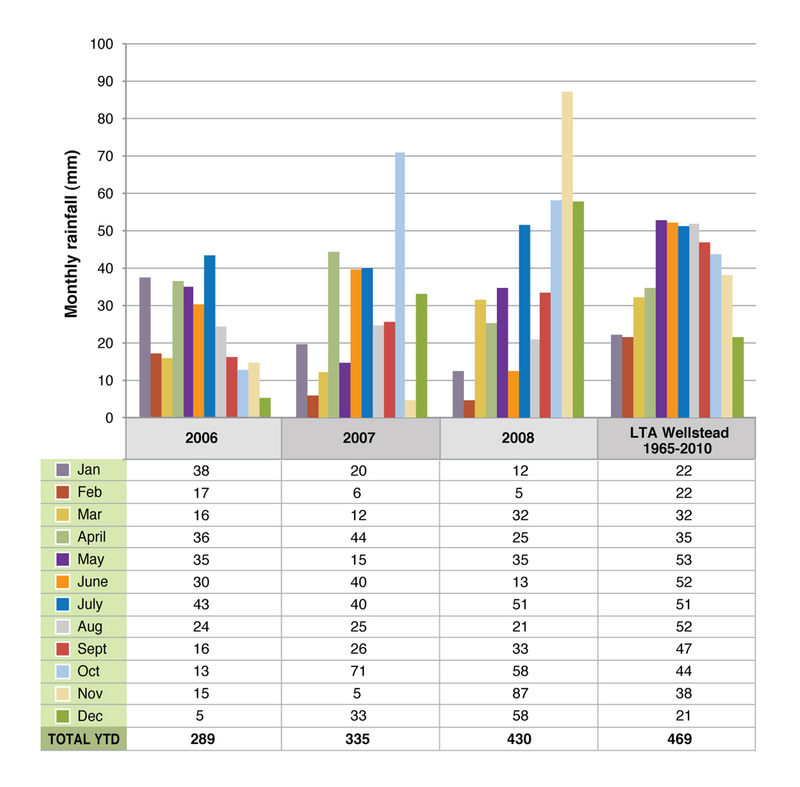 Each year during the experiment period (2006, 2007 and 2008) received below average rainfall with 289, 335 and 430 mm recorded respectively compared to the annual average of 467 mm (1965-2010) (Figure 2). As a consequence of the dry conditions, pasture and livestock performance was lower than expected. Figure 2. 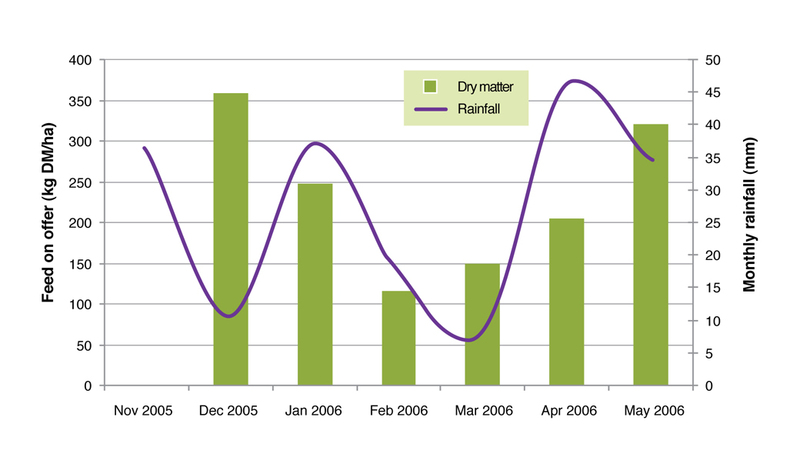 Monthly rainfall at Wellstead (2006-2008) compared to the average recorded (1965-2010). The modelled daily growth rates of perennial and annual pastures are presented in Figure 3 and Table 1. The results highlight the potential for out of season production from perennials, but higher winter growth from the annuals. Table 2 presents the modelled out of season dry matter production that perennials can provide in this environment. Figure 3. Modelled daily pasture growth rates (kgDM/ha/day) for the Proof Site Wellstead WA averaged from 1970 until 2010. Table 1. 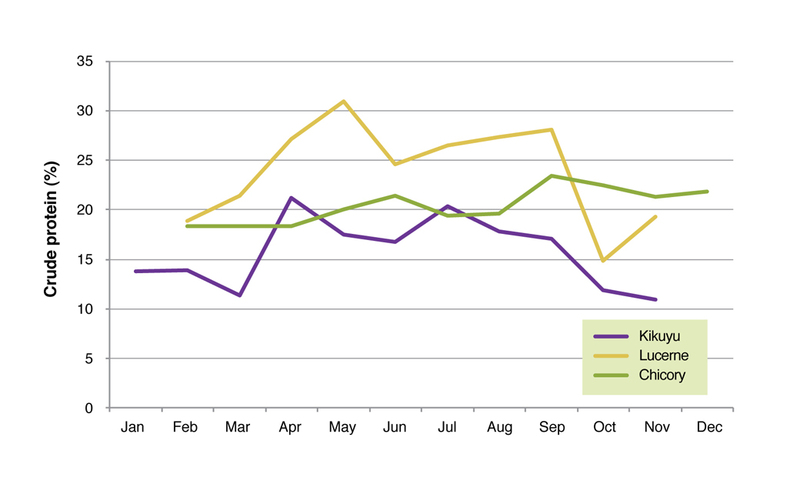 Modelled average daily growth rate (kg DM/ha/day) for each month and average annual yield at Wellstead from 1970 to 2010. Table 2. Modelled out of season pasture yield (kg DM/ha) from 1970 to 2010. Kikuyu has the potential to provide more green feed over the summer period than lucerne and chicory due to the plant’s ability to draw moisture from deep in the profile, respond to summer rain (Figure 3) and produce more dry matter for each mm of water (Figure 4 and 5). Kikuyu can also tolerate continuous grazing at a high stocking rate and prevent soil erosion in autumn by maintaining ground cover. As a consequence kikuyu is the most widely adopted perennial on the south coast of WA. Figure 4. Kikuyu response to rainfall in terms of monthly DM yield in summer and autumn 2006/07 at the Proof Site Wellstead. Figure 5. 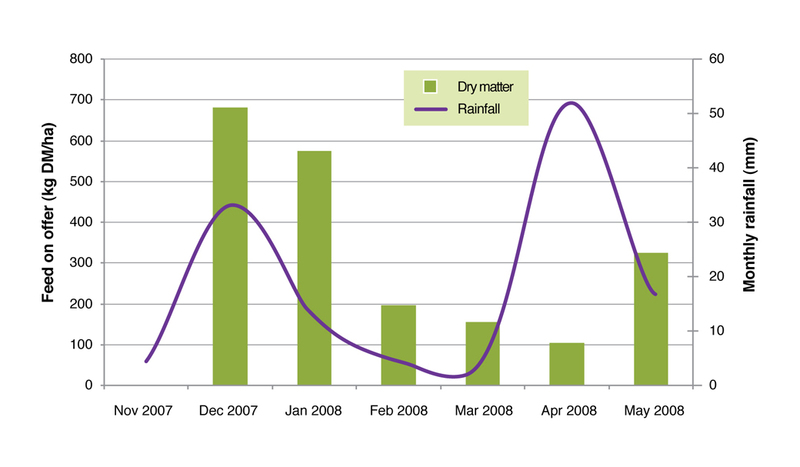 Kikuyu response to rainfall in terms of monthly DM yield in summer and autumn 2007/08 at the Proof Site in Wellstead. 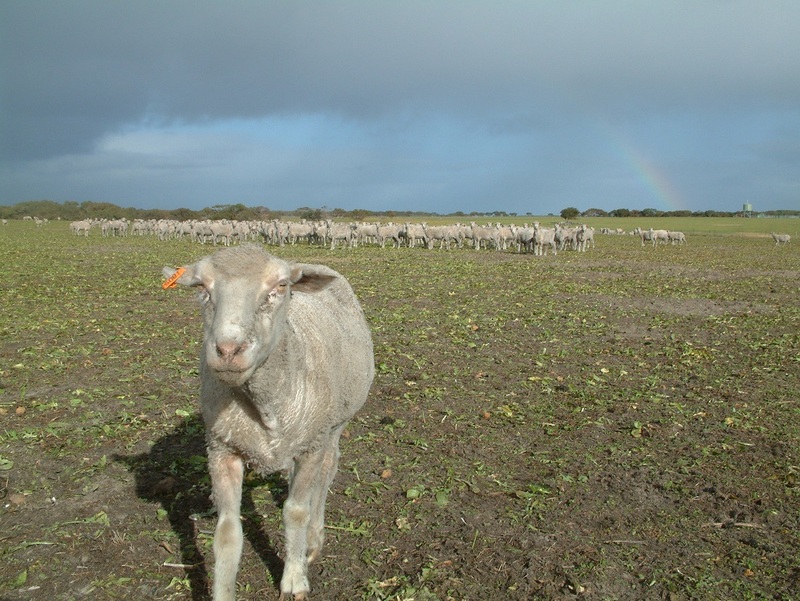 Highly nutritive perennial forages such as lucerne and chicory have considerable value for finishing prime lambs. When annuals senesce in late spring, lucerne and chicory continue to grow, limited only by a lack of soil moisture. 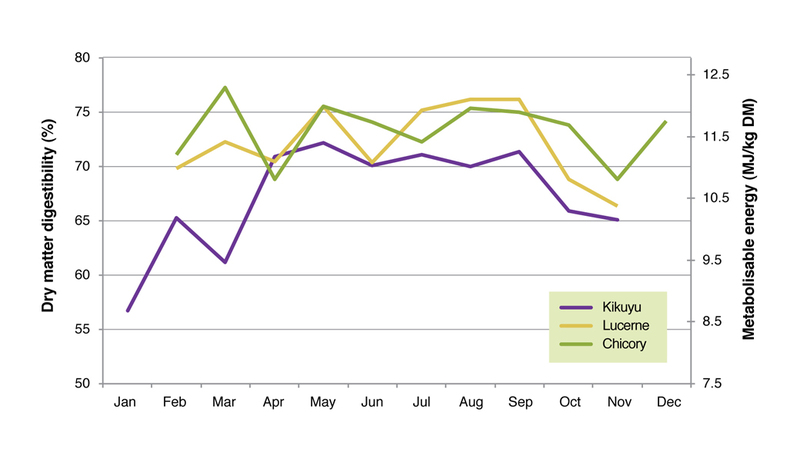 Quality analysis for kikuyu, lucerne and chicory was averaged for each month across 2006 to 2008 at the Proof Site (Figures 6, and 7). Figure 6. Dry matter digesibility and metabolisable energy of kikuyu, lucerne and chicory averaged over 2006 to 2008 at the Proof Site in Wellstead. Figure 7. Crude protein (%) of kikuyu, lucerne and chicory averaged over 2006 to 2008 at the Proof Site in Wellstead. High quality from chicory and lucerne enabled lambs on the Proof Site to achieve up to 336 g/head/day through December and January. See Perennials for finishing lambs for full details on the lamb performance from perennials. Most sheep producers in WA join in summer. Low feed availability and quality at this time can result in failure to meet optimum ewe condition for joining (Lifetimewool optimum is CS 3), causing low conception rates. Kikuyu has the ability to maintain ewe condition in summer, with high quality perennial pastures chicory and lucerne having the ability to lift liveweight and condition score. The Merino ewes at the Proof Site achieved an average scanning of 155% and average weaning of 120% over the three years the trial was run. Energy intake from pastures and resulting feed requirements can be determined using the ration development calculator in the EverGraze Feed Budget and Rotation Planner. According to the calculator (using Lifetimewool figures), annual pastures at 40-50% digestibility and with 1000 kg/ha available would result in an intake of 2.2-4.7 Megajoules metabolisable energy per head per day (MJ ME/hd/day). At this intake, ewes would be losing condition or requiring supplementary feed to meet maintenance energy requirements at around 8 MJME/hd/day, At the same feed availability, kikuyu at 65% digestibility would result in intake of 7.9 MJ ME/day and lucerne or chicory at 75% digestibility would result in 11.7 MJ ME/day. EverGraze research at Wagga Wagga also showed that grazing ewes on high quality feed (lucerne or chicory) for one week prior to and one week during joining can result in higher twinning rates and up to 10% additional lambs marked. Chicory is a high quality feed source able to increase ewe condition score in autumn. Pregnant ewe in autumn letting us know it is time to move to the next chicory paddock under the rotational grazing system. Morgan and Debbie Sounness on the south coast of WA aim to have 75% of their farm under kikuyu. 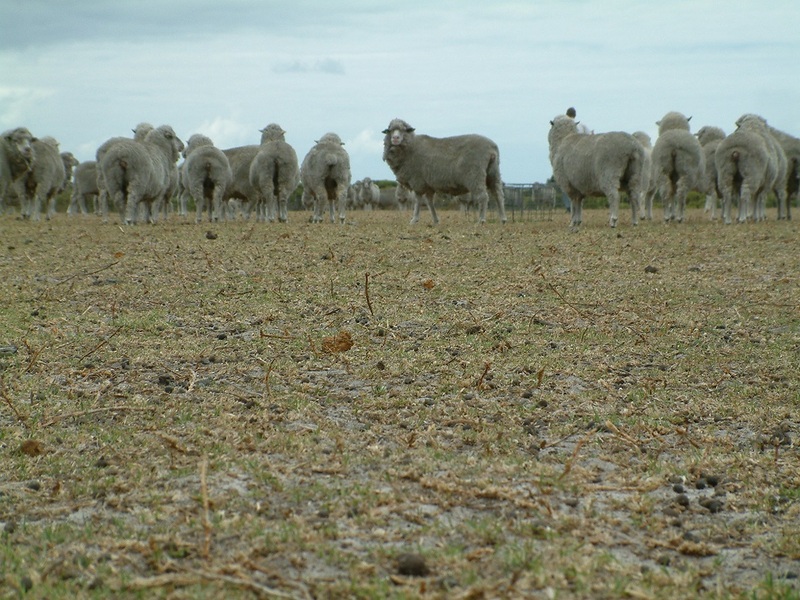 They run a fine wool Merino enterprise where kikuyu is effectively used as a green feedlot. The kikuyu provides relatively consistent nutrition throughout the year with Morgan providing mineral supplements and oats when required. The kikuyu also plays an important role in maintaining ground cover on the sandy soils at this farm. 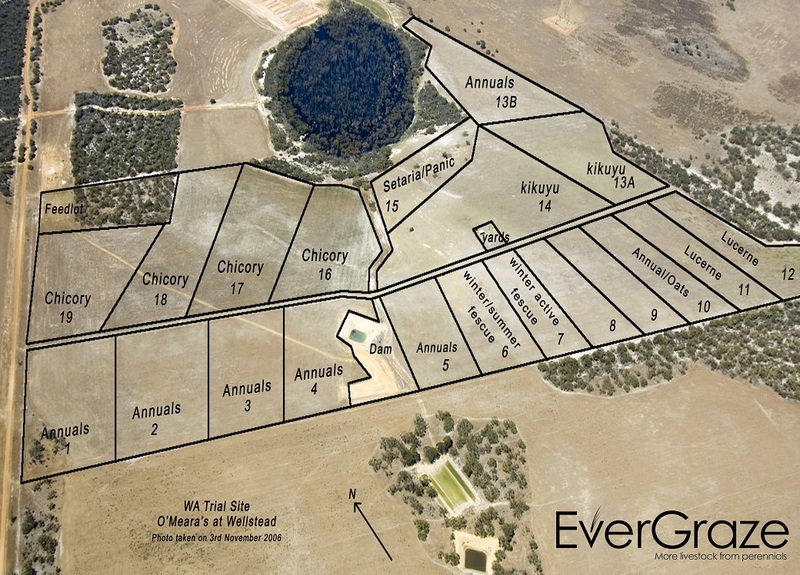 Erica Ayers and Phil Cleghorn from Esperance have expanded their area under kikuyu from 50 to 250 ha. Phil said, “Keeping ground cover year round is critical with our coastal soils and kikuyu has proven an important tool against wind erosion. Not only does it provide quality feed and cover for the soil, but also immediate growth and response to out-of-season rainfall, extending the growing season quite substantially. It will grow right through the year”. 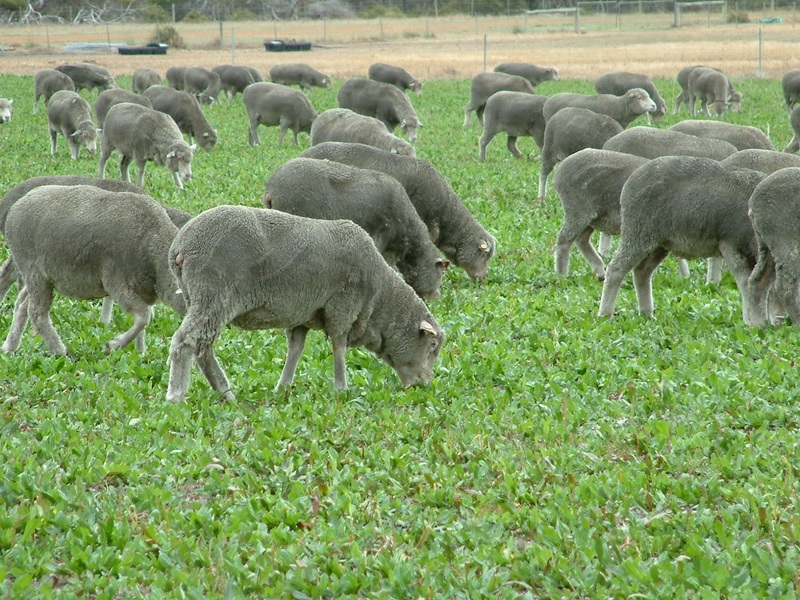 Depending on rainfall during late spring and early summer, the perennials have provided extra grazing days of higher quality FOO to weaned lambs. This was highlighted when in one year, 40% of weaned lambs from the perennial farmlet achieved the minimum slaughter weight of 44kg or 18kg carcass weight by mid December compared to only 20% from the annual farmlet for these July born lambs. Modelling using GrassGro was carried out to investigate optimum stocking rate, proportion of perennials in the system and time of lambing for the EverGraze Proof Site region. Results indicate an 11% reduction in supplementary feeding and a 44% increase in gross margin ($100/ha) could be achieved when perennials were introduced into the feedbase compared to an annual only system. Further information on the modelling can be found on the key message page – Adding 25% perennials will give the highest gross margin. The value of summer green feed from perennials can be estimated by a direct comparison to the cost of energy in grain, expressed as cents per kilogram of metabolisable energy (c/kg ME). For example, the calculated costs of energy (c/MJ ME) in different feed sources are presented in Table 3, with barley calculated at 2.04 c/MJ ME and pellets (Other feed 1) at 3.86 c/MJ ME. At the Proof Site, chicory grew on average 12 kg DM/ha in December, 8 kg DM/ha in January and 8 kg DM/ha in February (Table 1) and with an average energy value of around 11 MJME/kg (Figure 8). Assuming a livestock utilisation rate of around 70%, this equates to 10,164 MJ ME available for consumption from chicory through the summer period. The equivalent cost of this energy purchased as barley would be $207/ha and for purchase of pellets would be $392/ha. The perennial species studied were able to extend the traditional growing season and utilise summer rainfall. The extent to which they can lengthen the season is dependent on soil moisture availability. However even when soils contain very little moisture, perennials will respond to rain both in summer and at the break of season. Rainfall distribution through the year will also have a big impact on perennial performance. Locations that receive summer rainfall will get growth and therefore will be able to carry more stock over this period. These areas may be more suited to summer-active perennials such as lucerne, chicory or kikuyu while those that have long cold winters and drier summers may be better suited to winter-active perennials such as summer dormant tall fescue or phalaris which extend the growing season, grow well in winter and are dormant in summer. Producers should also think carefully about what they are trying to achieve. There are several perennial pastures that can provide out of season feed under the right conditions. Their feed quality, production and management however can be very different. For example if producers are looking to finish prime lambs then they should grow better quality forages that will drive animal growth rates like lucerne and chicory. If however they are after a maintenance diet for adult stock then a tougher more robust perennial like kikuyu may be more suitable. If establishing perennials, it is important that they are put in the right part of the landscape and managed to persist to enable the return on investment to be realised. While kikuyu can tolerate set stocking, lucerne and chicory require rotational grazing. 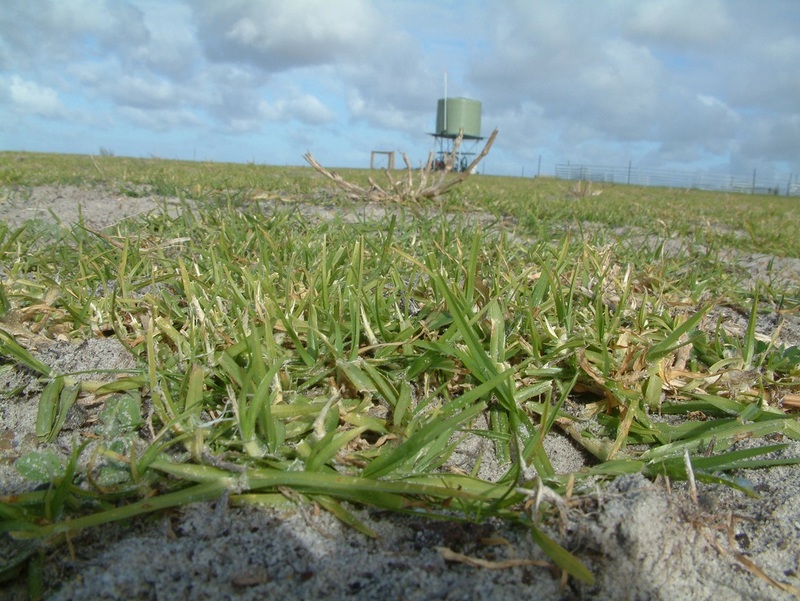 At the Proof Site, chicory plant numbers increased over the course of the four year period (2006-2009) while lucerne did not establish well and declined in numbers due to the unsuitable shallow top soils at the site – see ‘Kikuyu, chicory and panic proved to be the most persistent’. Deep-rooted summer active perennials have the ability to utilise summer rain and soil moisture, extend the growing season and reduce the requirement for supplementary feeding in summer and autumn. They also add flexibility to livestock management in lamb finishing, wool production and reproductive performance. There are several perennials that can provide out of season feed. However they do vary in production, quality, suitability for different soils, rainfall distribution and management requirements. Before making decisions on what to sow, producers need to consider the right plant for the right place, in addition to the intended purpose – whether the aim is to maintain stock over summer or develop a finishing system for young animals. The answers to these questions will determine the species to sow, and the area required.